Other names: Scarlet Lily Beetle, Lily Leaf Beetle or Asiatic Lily Beetle. The bright red body, black legs and head make Red Lily Beetles very striking in appearance, but these little beasts are very destructive to bulbous plants and in particular Lilium such as Turk's cap lilies, Asiatic lilies, Oriental lilies and Tiger lilies also some Fritillaria species. As with most destructive invertebrates it is the larval stage that does most on the damage. From spring to autumn the beetles and larvae feed on the foliage, flowers and stems. The removal of the leaves deprives the plant of food production which severely weakens it and may prevent flowering the following year, or in severe cases kill the plant. 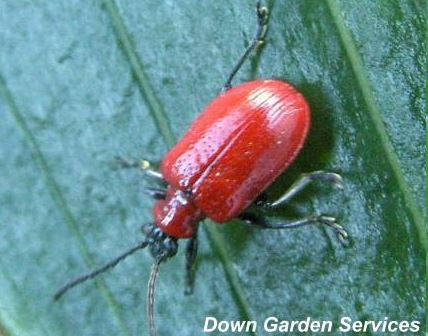 The Lily Beetle is native to mainland Europe and Asia, but not the British Isles. First reported in Southern England in the nineteenth century, it is believed that they did not become established until the 1940s. They had been confined to the south, but the recent increase in average temperatures has allowed them to move northward, and some of the specimens pictured here were found in a garden near Newtownards, County Down in October 2006 - the first reported find in Northern Ireland was in a garden in Belfast in June 2002. Since then the numbers have rocketed and in summer 2010 I squashed dozens of them; the extremely low temperatures in December 2010 and January 2011 do not seem to have caused them any problems as I have already found several while doing spring tidy-ups in 2011 - temperatures down to -18°C were recorded locally. So these must be a more resilient variant or the notion that our lower temperatures had prevented them being here in earlier times, was incorrect. They have also moved to North America, first reported in Canada in 1945 and now spreading south in the eastern states of USA. of a number of leaves. 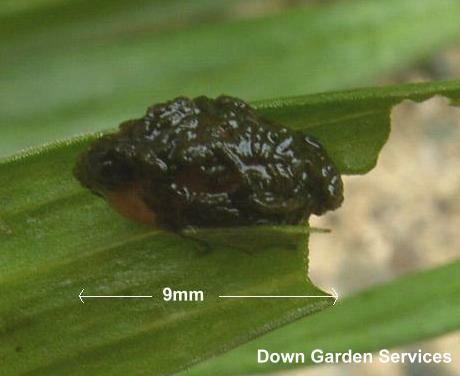 In the spring the beetles which have overwintered climb out of the soil and after mating the female lays her oblong eggs in lines under the leaves of Lily plants or Fritillaries - there can be as few as 2 or 3 on a leaf or a small clump and the colour can vary from bright orange to dark brown. 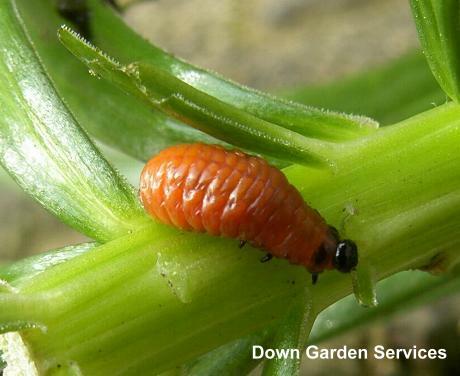 The orange larvae emerge after 7 to 10 days and begin feeding - first instars from underneath and later ones eat through the foliage, working from the tip to the stem. They cover themselves with their sticky black excrement to act as a deterrent to predators, so the orange colour disappears and they are more difficult to distinguish from bird droppings, but the leaves are usually damaged and the black colour stands out. The larvae cause most of the damage and spend two to three weeks stripping the foliage, then the flower buds before dropping to the ground to pupate. After two to three weeks the bright orange pupae have metamorphosed into new beetles which climb into the plants to continue the cycle. Mating can occur from spring until autumn and surviving beetles move to the ground to spend the winter, not necessarily close to potential host plants. The adults have been found on other plants including Lily of the Valley, Soloman's seal and Day Lilies. 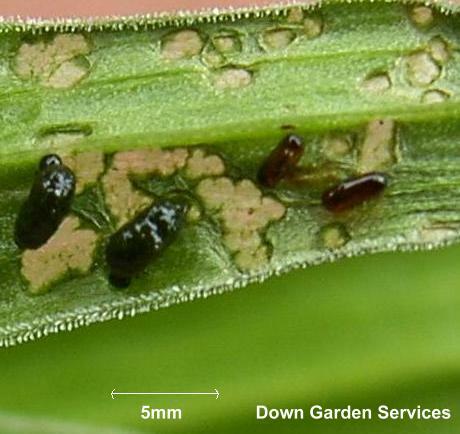 The larvae have only been found on bulbous Lilies and Fritillaries. The beetles make holes and notches on the upper foliage which is an indicator that the whole plant should be examined, although in this case a beetle is in clear view. 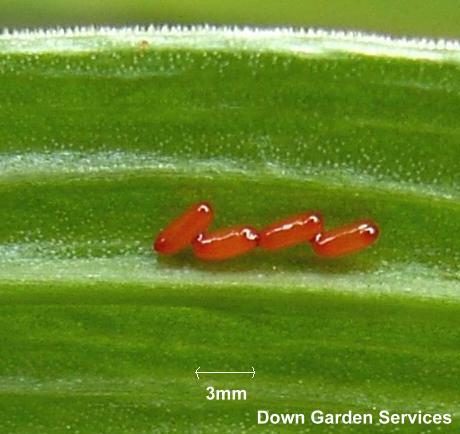 There were also eggs present when the undersides of the leaves were checked - three or four on each of several leaves. The recommended method of removal is to check affected plants regularly picking off and crushing any beetles, eggs or larvae. The beetles tend to drop to the ground when the plant is disturbed with their black undersides showing, so they are easier to find if a light-coloured material is placed there first. Approach from below and lift the leaf, trapping the beetle against the stem. Due to the difficulty in spotting the larvae a follow-up treatment with an insecticide is advisable, but the presence of Ladybirds may rule this out so such treatments would suit potted specimens which can be isolated - one containing *Imidacloprid such as Bio Provado Ultimate Bug Killer (Imidacloprid and Sunflower Oil) - sold as Merit in the USA. As a preventative the insecticide can be applied as a drench to the soil in the spring to eliminate the overwintering beetles before the lilies start into growth. A more "friendly" insecticide made from extracts of the Neem tree is also effective when applied to the early stages of larvae. It kills them and deters the beetles. There are no biological controls, but they are attacked by parasites in their native areas. Some research has been done with a parasitic wasp. The beetles can fly in at any time so regular checks are required as they seem to be endemic all over the British Isles now. There are a few preventative measures which can be taken, such as checking new bulbs for larvae before planting. Probably the most likely method of spread is the recent trend of buying established lilies in pots. It used to be that we bought bulbs and planted them, but the marketing of "added value" products means that the horticulture industry can make more money by potting them for us. They are grown in warmer places in close proximity to each other so the pests have a better chance to thrive. So check any such purchases carefully before introducing them to your garden. *Imidacloprid is a neonicotinoid compound and these have been suggested as as causative agents of colony collapse disorder (CCD) in Honeybees. It is currently banned in EU countries so insecticides have been reformulated to take this into account.